This light and accessory manufacturer has been established for nearly 30 years. They manufacture exquisite interior, exterior and custom light fixtures – a market segment with high barriers to entry and are listed with the Underwriters Laboratories and is certified for the Canadian sale and distribution. 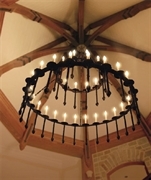 All of their fixtures are hand forged and finished and are LED compatible. Due to their designs, ability to customize products, prompt execution and timely delivery the firm has become a favorite with interior designers, architects, hotels and real estate developers. All of the enterprise’s furniture, fixtures, equipment, goodwill and permitting are included in the sale. $450,000 in inventory will be sold at cost at close in addition to the purchase price.